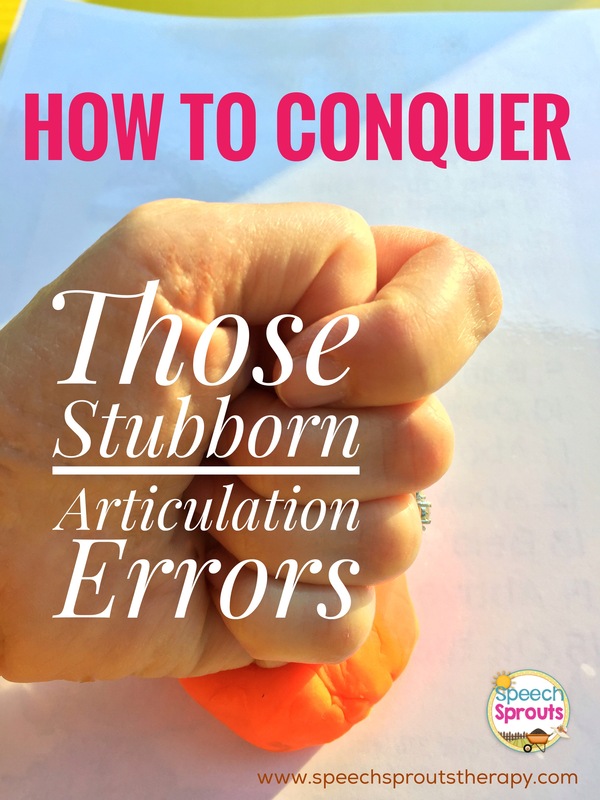 Conquer those stubborn articulation errors in speech therapy! Ever feel you are stuck in articulation therapy quicksand with certain students? As pediatric speech-language pathologists, we have all been there, one time or another. We’re trying every trick we know to elicit that perfect /r/ or stubborn /t/ for /k/. Yet nothing sticks. 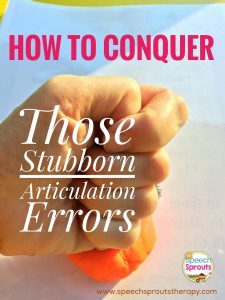 Stubborn articulation errors? Conquer them with these speech therapy tips. Pair the articulation sound with a character and an action. I have three students right now that don’t approximate their lips for initial /m/. Instead, they put their teeth on their lower lip when attempting to produce /m/. So, I think this would be the perfect week to get out my monster puppets. This idea would also go great with a monster tissue box like this one. 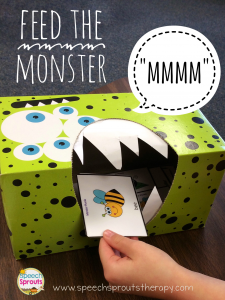 Feed The Monster Articulation Activity. My kids go bananas over these easy-to-make box and love to feed him. He says “FEED ME, I’m hungry! I make munching and burping sounds after they “feed” the monster, and sometimes the naughty monster likes to bite! (He lunges a bit at their hand, they squeal and giggle over that one.) Have your student say “mmmm” each time the monster eats a card if you are working on /m/. Multi-sensory cues are marvelous, magnificent and meaningful for articulation! Sorry, getting a bit cheesy here. I admit it, I am a bit of a word nerd. Somehow I suspect some of you might secretly be one too? But I digress…. Let’s think about this. When verbal cues just aren’t doing the trick, multi-sensory cues can come to the rescue. Have you tried these? 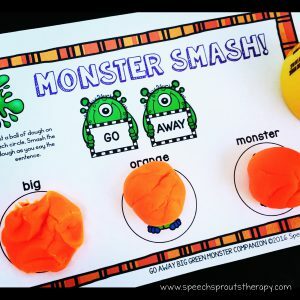 Linda from Looks Like Language has worked extensively with children who have multiple impairments and often some degree of motor planning difficulty. For children with motor planning issues, visual and tactile cues can be very important. Linda finds that a touch in the area that the sound is produced provides tactile information about placement that children respond to. She pairs it with a gesture that mimics the manner of production, such as punch-like movements for affricates or long flowing movements for sibilants. She recommends reducing the level of cuing and support as they progress, from choral production, then to quiet modeling, to tactile and gestural cues only, then ultimately independent production. Another great activity to try is to wad up a piece of tissue and play “football”. Put it on the table between you and take turns saying “puh” right in front of the “ball” to move it toward the other player with your puff of air. First one to send it over the edge wins! A taste cue you say? Yes! Try this to help your student hone in on the right spot on the upper palate to produce /l/ or even /t/ or /d/. Take a peppermint candy and swab it with a moistened q-tip. Then paint the spot (we call it the “la” spot in my therapy room). have your student say “la” and report on how the spot tasted. Breath mint drops also work well on the q-tip for flavor. I also like to take the cue tip and rub it a bit on the spot for a tactile cue as well. Ask,” Does that tickle a little? Now put your tongue on that spot and say “la”. I love to pair wonderful children’s literature with teaching a sound. Children are very willing to engage in activities with familiar characters and themes and are much less likely to tire and shut down or refuse to try. This activity is from my book companion pack for the terrific book, Go Away Big Green Monster by Ed Emberley. Don’t know what books are great for the sound you are teaching? I have done the work for you. Read my post on Speech Sprouts HERE and then grab my Sound-Loaded Books for Articulation Freebie to get you started. Ashley of Sweet Southern Speech works on the tongue tip up position for /l/ or /r/ by having her students lick a spoon upside down to replicate the tongue curling up. Jennifer of Speech Therapy Fun has her kids lie on their backs as they attempt /k/ or /g/. You may have seen the dental floss pick trick Natalie Snyders blogged about. Ashley B of AGB Speech Therapy found smaller flossers at the Dollar Tree recently that have really helped with that trick. She also likes using the SLP Tutor App because it helps her students see how the sounds are being made. Pam Marshalla made several placement cue videos which are available on YouTube. She was a wonderful SLP and is missed, but we are still learning from her. View one HERE. Sometimes we need to back up and take a new approach. Consider whether the student has the maturity and readiness to correct a specific phoneme at the current moment. If not, take a break and work on other goals if you have them. Then come back with a fresh approach. You know how we are often amazed at how our students have progressed over the summer? I think that is because they have taken a therapy break, and are not over-thinking their production. You may be surprised and see a new level of responsiveness when you cycle back to your goal after a break. We would love to hear your best tips and tricks! What works for you? Just leave a comment and share. Together, we may be able to banish those hambuguhs that plague our kids!